Utilities costs are not going down any time soon and winter is surely upon us. The areas of your home that affect your cold weather heating costs the most are the basement and attic but there are ways that you can reduce heat loss in these vulnerable areas. Taking the right steps this winter will help to reduce energy costs and also help to you to avoid any possible cold weather damage. Heat loss in the attic is one of the leading causes of higher than necessary utility bills. It’s easier to search for air leaks on either windy or rainy days. All you need to do is look either for wet spots or feel for drafts. If you find any gaps it’s an easy job to fix the problem using weatherproof caulk. For best results be sure to apply the caulk outside as well as inside and you will get much better results. If you can see the joists in your attic than you don’t have sufficient insulation to keep the heat in. A minimum of 12 inches is recommended and more won’t hurt. If you have metal pipes in the basement than they need to be insulated as well to prevent freezing. Foam insulation for this purpose is available at all home improvement centers and is very easy to install. Windows Are Like Big Holes in Your Walls! Although you may have high quality windows in your home many times the windows in attics and basements are not as well insulated. If this is the case in your home than I suggest using those plastic film kits that are made to cover drafty windows. 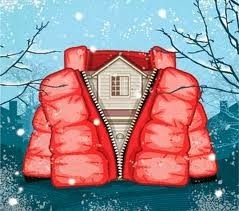 They are highly effective at keeping out the cold and cost very little money. If you take a good look at the metal duct work in your attic and basement you might find plenty of spaces where the pieces are joined together at the seams and joints. This is actually quite normal but can cost you plenty of wasted hot air. A roll of aluminum tape will quickly solve this problem. Simply wipe down the duct work with a damp rag so that the tape will stick well and go to work! This simple step can save you a bundle in utility bills. The less your heating system can “breath”, the more money it costs to operate. A simple filter replacement each fall will ensure a more efficient heating system and that is a definite money saver. Most attic fans have a switch that allows you to reverse the direction that it is circulating air. In the winter time if you change it to draw heated air upward instead of blowing cooler air downward you will see a noticeable difference in your utility bill. Simple and effective. This is the One that Everybody Forgets! You know those attic steps that you pull down when it’s time to go up? Guess what? Most of them are NOT insulated and as a result you may be heating your attic! There are several ways to insulate this door to prevent this problem depending upon the way it has been installed. One cure is a wooden “box” or frame that is made to cover the entire door and prevent air circulation. Another way is to actually insulate the edges of the drop down door with a special seal. Your best bet is to check with your local home improvement center to see what’s available. In a pinch you could even use a heavy duty plastic tarp. Anything is better than nothing and will help to keep the warm air where it belongs.